Right from the opening track ("These Kind of Ice Skates") it is clear that we are faced with a slightly different Joyce Manor to the one whose self-titled debut LP fitted snugly between Swamp Thing and Make Do And Mend on 6131 Records’ release catalog. Where sunny 90's melodies and pop-punk undercurrents were previous buried by outrageously dirty guitars and a bass tone so low most laptop speakers wouldn't even pick them up, they have been put under a magnifying glass on "Of All Things I Will Soon Grow Tired". Stylistically, Joyce Manor still work within the same framework (think Jawbreaker meets Tigers Jaw via Hot Water Music), but the hooks and melodies have floated closer to the surface, and the rapid drum lines and harsh guitar licks that personified their first record now push and snag with more precision. With production courtesy of Jack Shirley (guitarist in Comadre and One's Own Ruin) serving as a guiding hand, Of All Things… is organized noise at its finest. 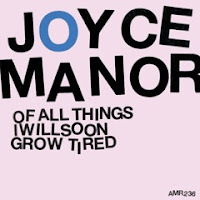 The great thing about Joyce Manor is how naturally effortless they sound; as if they knocked out all their songs in someone’s garage during a jam session and left them untouched, with the end result still sounding incredible. Recently, words like “organic” and “raw” are usually thrown around in relation to the hordes of basement-dwelling guitar-heavy indie bands trying to sound like Pavement, but pulling back the thinly veiled pretense you will normally find that each chord is very self-conscious, each broken-vocal planned out. Joyce Manor has none of that. Theirs is the kind of give-no-fucks attitude that allows them to drop a cover of "Video Killed the Radio Star" right in the middle of their record and have it met with fist pumps, as though every album that doesn’t have an 80’s centerpiece so upbeat that it deserves to be featured on a "Pop Goes Punk" compilation suddenly makes no sense. Variety is definitely not an issue on this record, often skipping from a soft and minimal acoustic numbers ("Drainage") to the brutal punches in the ear canal ("If I Needed You There"). Channeling a combination of Sunny Day Real Estate and The Descendants, they are a reminder (for those who need reminding) of what emo was before Dashboard Confessional, what punk-rock was before Good Charlotte, and that pop-punk is actually awesome. The final three tracks land sunny-side-up, with "Violent Inside" layering bright guitars and uplifting tones over frustrated lyrics about those days when you really, really don't like anybody. "Bride of Usher" even has a jangly vibe that they manage to make their own before ending on a curt lo-fi acoustic track ("I'm Always Tired") that owes much to The Get Up Kids circa "Four Minute Mile". 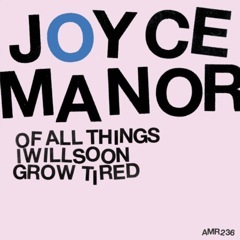 Clocking in under twenty minutes, Joyce Manor have kept things short and solid once again, but notably this time around there is a stronger definition to the tracks, with each standing out more boldly in their own right yet still carrying that distinctive 'Joyce Manor' stamp that ties them all together. "Of All Things I Will Soon Grow Tired" is a punchy and self-assured sophomore release from a band who continue to do everything right by doing what they love, and make no compromises along the way. "Of All Things I Will Soon Grow Tired" is out April 17th through Asian Man Records.